Cuban President Raul Castro will step down in April 2018 straight after his successor is chosen by a top governing council, according to a vote in the island state's National Assembly . The decision means Castro, 86, will stay on two months longer than previously anticipated. He was to have stepped down in February under a system tied to the Communist-ruled country's electoral calendar. But polls have been pushed back because of a damaging hurricane that hit the island in September. Cuba's president is designated by a 31-member body called the Council of State. The head of the council is automatically president of the country. But the Council of State first has to be selected by the National Assembly which has about 600 seats, a process that will now take place on April 19, lawmakers voted in a session closed to international media. The new National Assembly will be elected at a date yet to be set. Castro, who officially became president in 2008 after serving as interim leader for two years, had already announced he would not be seeking a new mandate. His departure will mark the end of six decades of Castro rule. His late brother Fidel Castro, who died last year, governed the country after seizing power in 1959 at the head of a leftwing revolution. 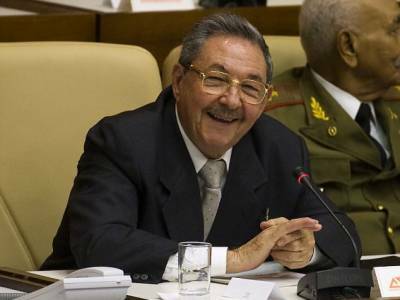 Raul Castro , however, is expected to remain leader of the island's all-powerful Communist Party of Cuba until its next congress scheduled for 2021 -- when he will be aged 90. His first vice president, Miguel Diaz-Canel , 57, is seen as his likely successor. Whoever is designated president would have the difficult task of consolidating the Communist principles established by the Castros while pursuing an economic transition plotted by Raul Castro .